Good to hear.. I am on the virge of orderering, waiting for payment on the rifle I just sold.. I found a few sales that last thru 5/31 for the holdiy soo I am hoping it all times together..
Everything points the panels you have to be maybe SolarTech brand..
UPDATE! That inverter i got the one that fried when i first got it and got another just like it is a ROAD PRO. I had a few beers tonight and forgot to turn the ac off im a little tipsy now but the window ac powered off! I went and checked the voltage on the batteries to make sure i did not mess them up to bad and it was at 12.01 so apparently that inverter shuts down at 12v which is good to know since there is NO knob to change the cut off on it. My next system will have one but im really happy it shut off at 12v. If i where you i would call the people your ordering your panels from and see how much more the 85 watt 24v panels are i think there right around 30 bucks more. It will probable save you alot of headache in the long run if you go ahead and get the 24v ones and set your system to that. Everyone wanted me to go with a better 24v system when i started but i did not listen. If you dont have alot of money to buy multiple 12v 24v systems to run separate things you might want to start with a 24v system. If your doing it as a hobby or just as fun to see what you can do with it get whatever but make sure you put your fuses in do not burn up your system right after you get it that would not be cool . Careful.. most inverters shut off at 11.5 or so volts.. your battery may have came back up a few volts after shutting off the A/C..
Like I said before whacking the batteries to about 12v everyday isn't going to make the batteries last very long.. IMHO..
12.2 (60%) or 12.32 (70%) is where I'd like to be at the end of the day personally..
ok after adding the fuse blocks to my solar panels it dropped my voltage going into the charge controller to 13.8 where i was getting 18 - 19v i added gold plated connections in and out of the fuse block, have know idea if that has anything to do with it or not? What brand/model of charge controller (i.e., MPPT or PWM). You will see the array voltage pulled down to ~Vbatt-charging with a PWM controller when driving 100% of the solar panel current into the battery bank (i.e., "bulk" charging). As the battery reaches "absorb" voltage around 14.5 volts), the PWM will start turning on and off, and you will see the array voltage bouncing around or slowly increasing (depending on frequency of PWM and how volt meter reads "choppy" voltages--I.e., Vbatt-charging and Voc-array). MPPT should see Vmp-array while charge controller is in "bulk", and as battery reaches 14.5 volts, the input may start to look like a PWM controller (choppy voltage or input voltage slowly rising). Note that for MPPT and PWM controllers, they can be at 100% rate of charge if there are other loads on the battery bank even if the controller is at "float" -- around 13.6 volts or so (i.e., bank at float voltage, but you are running loads from the system to your inverter/pumping/etc.). Adding fuse blocks, gold plated or not, should not reduce your voltage by anything like that amount. There is something else going on. Yes; it sounds like the panels are finally being connected to the batteries and the Voltage is getting pulled down as would be expected. Probably the previous connection had high resistance for some reason and was not functioning correctly. On a PWM controller you should expect input and output Voltage to be pretty much the same during Bulk charging stage. Cool i have noticed that the batteries have been staying charged but when my pump comes on my battery voltage drops down almost a volt is this a sign that i need more batteries because once the pump goes off the voltage shoots right back up to almost where it was. And is it ok to have my charge controller connected to one end of the battery bank and the inverter to the other or should they be connected to the same end of the battery bank was wondering if that would pull more from the panels than the batteries and save a little battery life. Any load that comes on and causes a Voltage drop could be a sign of insufficient wire size, insufficient battery capacity, or a normal operation of a really big load. My 1 HP septic pump causes a noticeable V-drop, but it runs under 1 minute per day (in the middle of the day) so i don't worry about it. There shouldn't be any different "ends" to your battery bank. How many batteries and how are they wired? The now familiar Smart Gauge reference: http://www.smartgauge.co.uk/batt_con.html Method #1 is to be avoided. The inverter and charge controller should be connected to the same points of the battery bank. ok let me see if i can explain how i have them wired i have 4 batteries all 12v i have all the + connected and all the - connected. 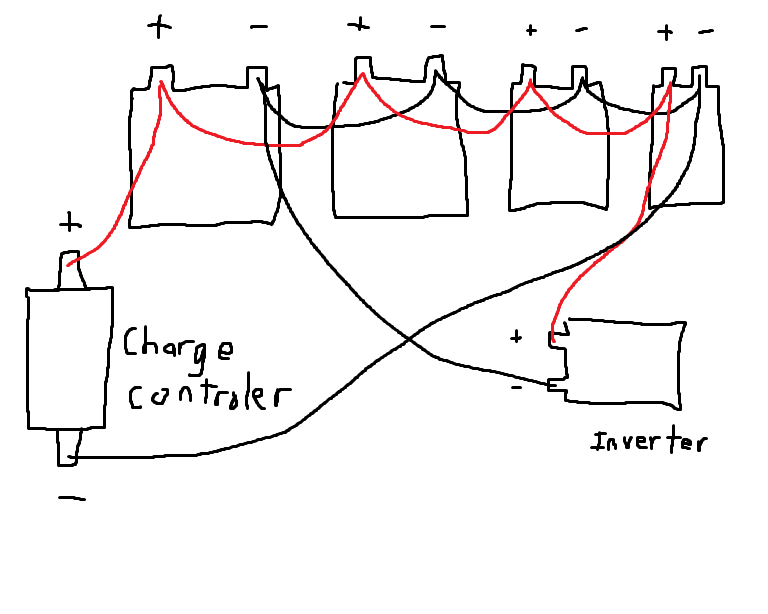 On one end ill call that line a and the other end line b. the charge controller is hooked to a+ and the inverters negative is connected to a- then on the other end i have the charge controller connected to b- and the inverter connected to b+. I hope this is not as confusing to you as it is to me trying to read what i just put down back to myself. Now I do have really really thick cables connecting the batteries together its 1" thick welding ground wire. I do have 2 different batteries made by the same company same brand bought from the same place. Only thing 2 are about as big as a regular car battery and the other 2 are 1 1/2 times the size. The bigger ones seem to say about .02 - .04 volts higher than the 2 smaller ones. One other thing ive heard that on a 12v system you cant go over 1kw is this true????? I would really hate to know that i was wanting to go way over that on my next purchase. I would not do it that way. Because. For one thing, you have 4 batteries in parallel and that alone will make it very difficult to properly balance the voltages across all batteries as they are being charged, or as they are being discharged. The amount may be extremely slight, but over time, the damage being done will add up. But to add to that problem by, at the same time as they are being charged through one set of terminals, having a load draw from a different set of terminals, is definitely not a good idea for battery life. My recommendation for this installation would be to have 4 equal length cables, one from each battery positive terminal, all joined at one common point, not at a battery terminal, then do the exact same thing with the negative battery terminals. This will give you one common point to connect all charge positive inputs AND loads, that is equidistant from all positive battery terminals. Then having done the exact same thing with the negative battery terminals, one equal length cable from each battery negative terminal, all joined at one common point away from the batteries, and at this one common point, connect all negative charge and load cables. This will give you the best possible chance of keeping your batteries properly balanced electrically. All cables have some resistance per foot. All cable ends and connections have some additional resistance, no matter how slight. And if each battery does not "see" the exact same resistance to load or charge, they're state of charge will drift away from each other over time and that will definitely not be good for your batteries. If you go to the Morningstar website under porducts you will see a link/button on the right hand for the String Calculator. Using your panel information it will tell you how many panels in 12/24/48 battery banks and such.. if you have a 45 or 60 AMP controller (I forget which one you said you had). you can pick it from the list.. if its a MPPT or PWM you can choose that to. For example I have a Morningstar TS45 controller (45 amp).. it says I can goto 6 panels and 725 watts for 12v.. and then if I change the battery bank to 24v I can double the panels to 1450 watts.. this would be 2 panles in series then the 6 'sets' in parallel. Now I figured out my amps to be 46.5.. and theres a 125% overage on the MS controllers.. so I could goto a MAX of 870 watts of panel.. which is what I just ordered.. there maybe clipping of the 1.5 amps if if gets there but thats ok for me..
What controller you have.. maybe we can figure it out.. if you have a 60 amp controller you may have a shot at 1000 watts in just parallel but not much more than that..
Wow thanks i think someone tryed to tell me that before but it went right over my head. That Is some great info thanks. One thing i need to know is how do i connect 4 1" cables to one point, Any recommendations would be greatly appreciated All my cables are exactly 1' 6" long, connected with regular top post battery connections. My charge controller is a xantrax c60 the 60amp one. I have 8- 85 watt panels each putting out 4.75 amps at 12v. The inverter is a road pro 12v 1500 watt 3000 watt max. How many batteries should i have if there like 50 amp hours each just guessing for a 680watt system? I would rather be over battery copassity than under! I would like to post the pdf's that my utility provider gave me to hook up to grid but i cant seem to figure out how to post them. Its alot of mumbo jumbo that i realy dont understand and would like some help with it. ok Im getting 8+ hours out of my window ac unit now that i changed the charge controller/inverter connections thats freakin awesome im still above 12.8v when i shut it off and its realy cloudy today! thanks Soo much for the info it helped sooo much. Got any pics of the new battery setup and controller connections?? getting ready to do mine so pics may help me..
IM not wanting to get into another discussion on bus bars again but just reposting the post from a long time ago and the results for FARMERJOHNAZ to see if this answers his question.. It shows the very tiny losses you get from using cheap copper tube available from any hardware store.. you just hammer or put in vice the ends of the short lengths of tubing to flatten them then just drill a suitable sized hole each end.. Here is the results of resistance testing and mechanical destruction testing of lugs on copper wires as used in battery interconnects and similar usage. As noted the resistance was given for 10ft lengths of pipe . If we are going to use any of those pipes as barttery interconnects etc obviously the length used would be about 8" to 10 ", so to get the resistance you would have to divide the above resistance figures by about 12. Tests involved to measure lug on wire resistance and mechanical strength. 2,Lug compressed with 500lb pressure on 3 serrated teeth jaws then lug heated and filled with resin cored solder. As you can see solder only is not good. As a further test the joint melted when a 140a load was connected to the cable and a 12v battery to the lug. Obviously not good. As you can see I didnt get much work done for employer the day I did all these tests, believe it or not it took 3 of us to do the tests .my work partner to verify the results ..As to do any destructive testing a workplace safety officer has to be present. Hope some of this helps people understand a little more about cables lugs copper pipes..
ok i have a kill a watt meter for my ac side that tells me how much power i have going out and a volt meter to tell me how much volts i have coming in. Do they make a watt meter or something like that, that tells you how much power my panels are producing? Ammeter. Measures Amps. Amps * Volts = Watts. There are wired-in Ammeters like this: http://www.solar-electric.com/aeedivome.html and there are clamp-on meters like the one Bill is always talking about from Sears (which I don't have a link to because this is Canada and such technology is forbidden here ). But they require constant monitoring to observe power "at the moment"; no recording. Better (more expensive) charge controllers have logging of such data built in. Keep in mind that panel power production will vary greatly depending on how much light is hitting them and how much loads (including battery charging) are drawing. There are DC WattHour/AmpHour meters--Here a couple that would work (I would not use it for more than 15 amps unless you hack the unit). Otherwise, get a charge controller with a LCD meter--Many have fairly detailed logging available, but you will have to spend ~$300-$600+ for such a meter. A Battery Monitor is pretty nice... Tells you want is happening with the battery (are you charging enough, too many loads left on, etc.). And here is the link to an inexpensive $60 DC/AC DMM meter. Some body here (could not find post) to a Radio Shack $60 AC/DC current clamp meter that does RMS (more accurate for variable wave forms) meter. Note that with any DC current clamp meter, you have to learn how to use the "meter zero" function. These days with modern micro computers and buttons everywhere, have made it so confusing that it takes time to figure out how to zero the meter (typically needs re-zeroing every few minutes). The Radio Shack poor reviews for their meter seem to mostly be about trying to zero the meter for DC current measurements. So--If you get that meter, make sure you can properly zero the meter for DC measurements (I played with my car's battery, turning on lights, etc. to learn the Sears meter).